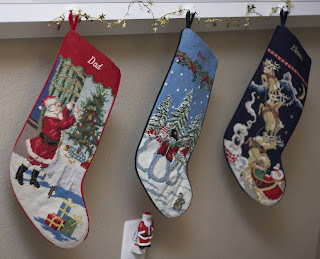 The stockings were hung by the...um, by the kitchen...with care. And look, Santa found them!! Tricked you- that's just a nightlight disguising the unisightly plug for the picture. We (I) searched high and low for stockings this year before finally settling on these from Land's End. They'll do. I hope I'm on the nice list, so I'll get treats in my stocking. Besides, I'd be pretty ticked off if a certain fat man with rosy cheeks ruined my new stocking by putting coal inside. Can Santa get into a gated community? How cute. It's funny that you posted your stockings today. I have a half post done about my Christmas decorations (or the lack their of). Anyway, they look cute! Where are the extra two (for the cats)?? Why bother with the cats? They're ALWAYS on the naughty list.